Nothing like going AWOL right after starting a new blog, eh? Well, these past several months have taken several turns and have kept us all busy. This past week, I was excited to finally be able to unpack my Cricut and get to work. I was like a kid in a candy store and had difficulty focusing on just one project to begin and then complete. 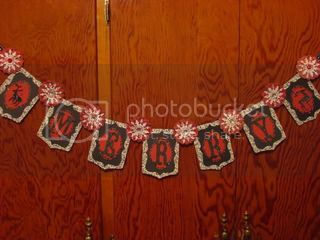 Looking for inspiration on several blogs, I noticed that many crafters had created holiday banners and so my journey began. 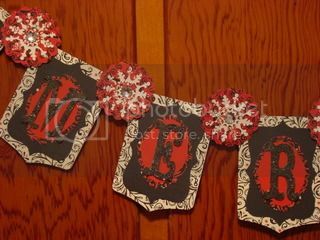 Cricut Cartridges Used: B is for Boy, Storybook, Lacy Labels, Christmas and Joys of Season. I did not have any chipboard on-hand so I upcycled some cereal boxes that I had been saving (for the perfect project). Though it is not perfect, and is fairly simple, I am a bit proud of my creation and proud that I finally learned how to use the layers feature on my Gypsy.